I wanted this to be a perfect blog post, but it started in a way that left me wondering how it was going to shape up. I was starring at three of Michael Hall's books in my lap, feeling a little stumped about the direction I should head for his birthday celebration, when my oldest daughter came over and said, "Hey, is that Perfect Square by Michael Hall? We did a project with that book in media class this year." 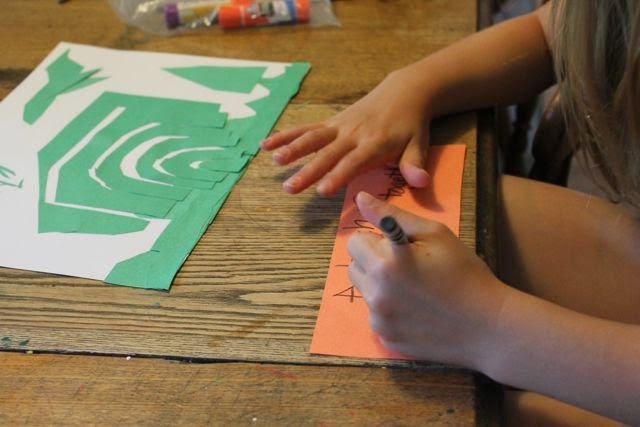 She went on to tell me that her teacher read the book in class and then they had 15 minutes to cut a paper square into shapes, arrange it into something else, and glue it on a piece of white paper. I said to my soon-to-be fourth grader,"Do you think you could show your brothers how to do it?" She agreed and I started to feel that maybe she could help me piece together our birthday celebration for Michael Hall. Michael Hall is the creator of four picture books including My Heart is Like a Zoo and Cat Tale. However, before creating picture books he studied biochemistry and psychology at the University of Michigan. Then, after spending a few years working in biomedical research he turned to graphic design. (from the biography in My Heart is Like a Zoo). He has dedicated over 25 years to Hall Kelly, Inc., a graphic design firm he co-owns and is the principal designer. His work has been described as "simple and engaging." 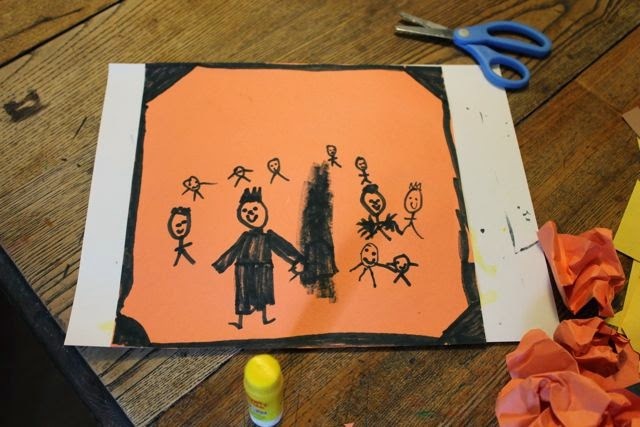 It was suggested to him that his "simple and engaging" artwork would be great in a children's book. He took the suggestion seriously and in 2010 he published his first book My Heart is Like a Zoo which features 20 animals that are illustrated with bright colors and heart shapes. Amazingly, Hall created around 70 heart-shaped animals before narrowing it down to the final group that made it into the book. (Click here to see some of the animals that didn't make the cut!). My Heart is Like a Zoo was followed up with Perfect Square which also brought many rave reviews. The story is about a perfectly happy square who is one day cut into pieces and poked full of holes. The square finds itself broken and misshapen throughout a whole week. But as Michael Hall describes, "with each imperfection, the square makes itself into something beautiful." (Under the Green Willow, The Official Blog of Greenwillow Books). Michael shared at the Mazza Museum conference that this book helped him cope with his daughter receiving a diagnosis that she had Type 1 diabetes. 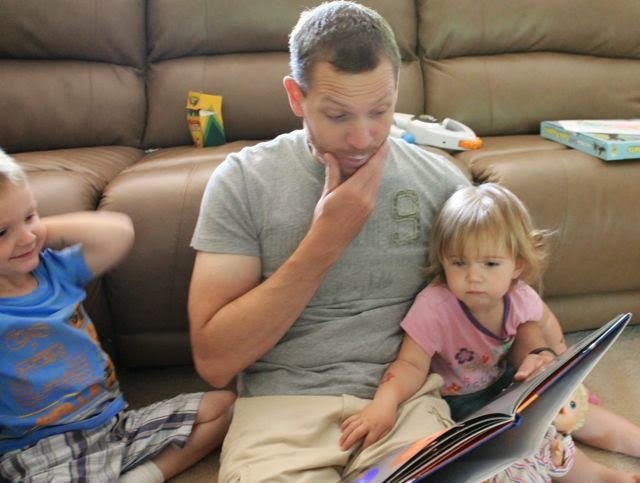 "As a father, when your child is diagnosed with chronic illness, you have to confront the idea of her being imperfect. Hannah's attitude, even when she was 13, was that she wouldn't be beaten by the disease. That's what the book is about -- finding beauty in broken. But it's broader that this one issue. It's also about adventure, change, expanding our boundaries." (Twin Cities). 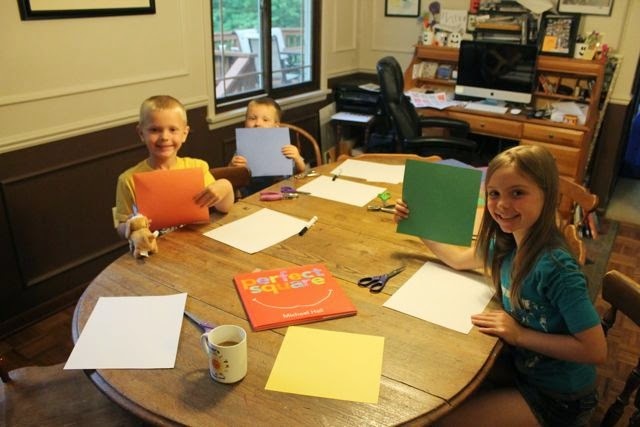 My daughter began the activity with her brothers by reading Perfect Square. We each picked out a colored piece of construction paper and then we cut it into a perfect square. My daughter pointed out that the squares that she used in school were much smaller. She gave guidelines to the project -- use scissors and hole punches to make your square into other shapes and then design something new. But, you must use all of the square. 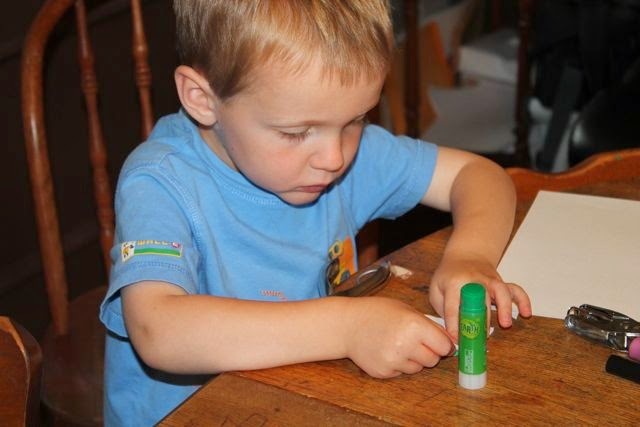 Lastly, you can use a black marker to add small details to your design. 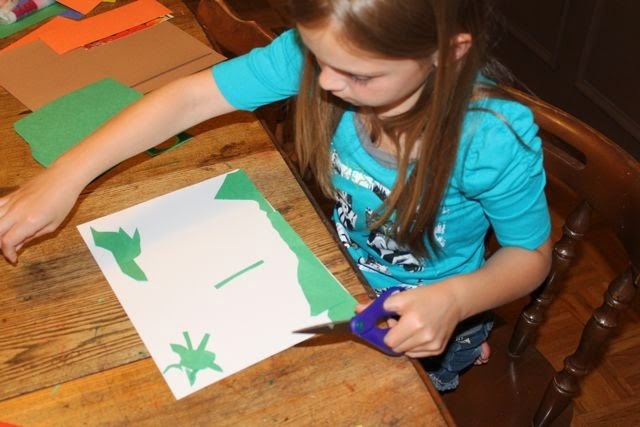 She was a great model for her brothers and got started right away cutting and creating a scene with her green square. My youngest son got busy too. My oldest son had some trouble getting started on this project. Notice the pile of crumpled paper on the left. 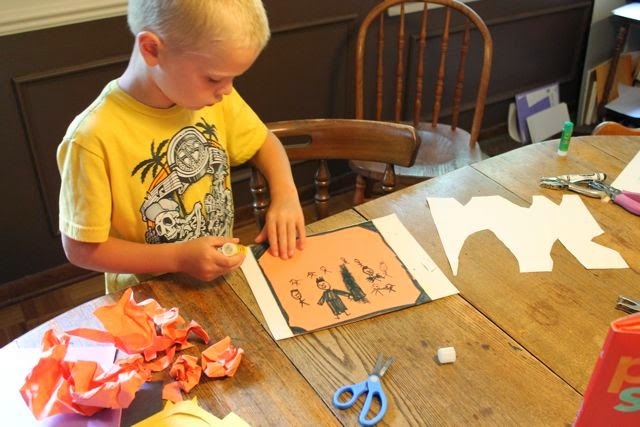 He really wanted to make a pumpkin out of his orange square but was frustrated that he couldn't have any scraps left over. I told him that it doesn't have to be perfect and that even though there are guidelines you really can make it your own. Later, I found this quote from Michael Hall which would have helped too. "Before I knew what sort of story this would be, I cut, ripped, and otherwise mangled hundreds of paper squares and looked for images in the resulting pieces -- like looking for animals in clouds. "(Under the Green Willow, The Official Blog of Greenwillow Books). He looked and looked at his square and said, "I want to make this a picture frame." I was so proud of him for not giving up. 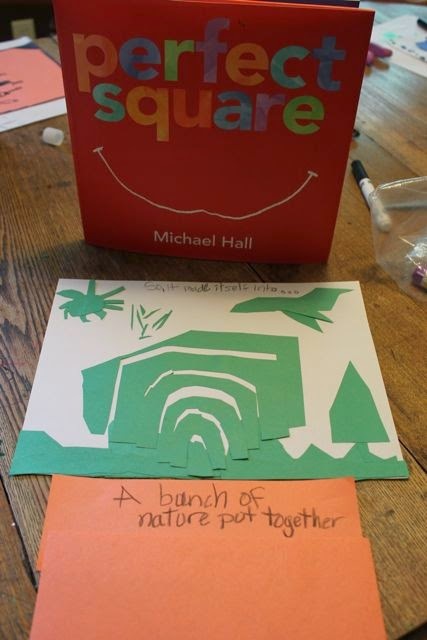 My daughter finished her design by writing, "So, it (the square) made itself into a bunch of nature put together." 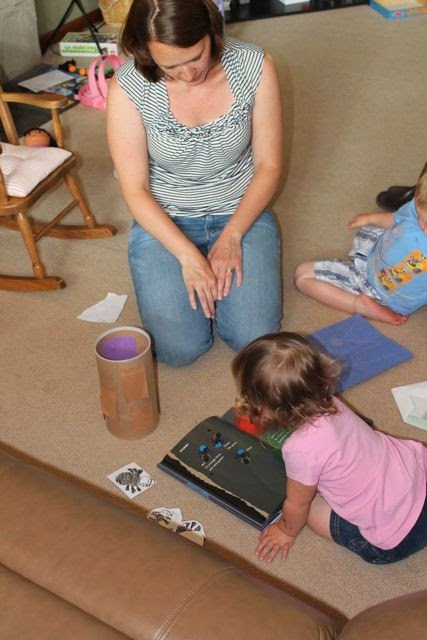 My son's perfect square became a picture frame filled with lots of people. My perfect square burst into many pieces and made itself into a bright and shiny sun. 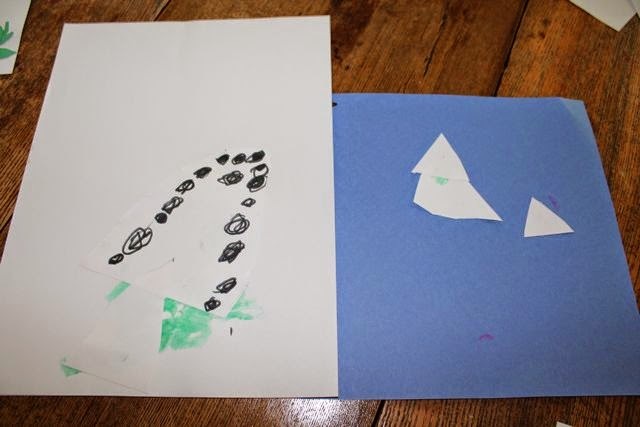 My four-year-old son worked really hard and made some Christmas trees! 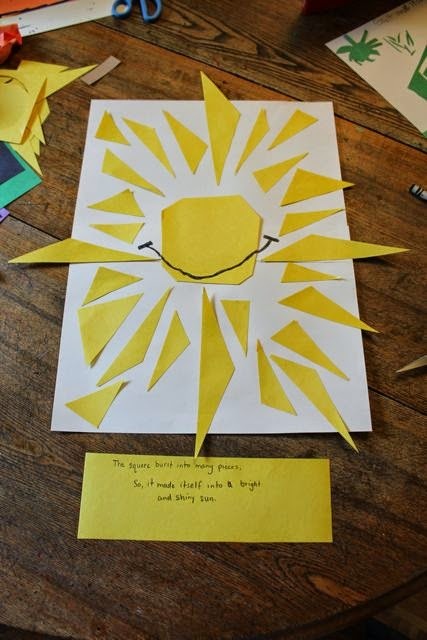 My daughter's art activity for Perfect Square would have been enough for this birthday blog post. 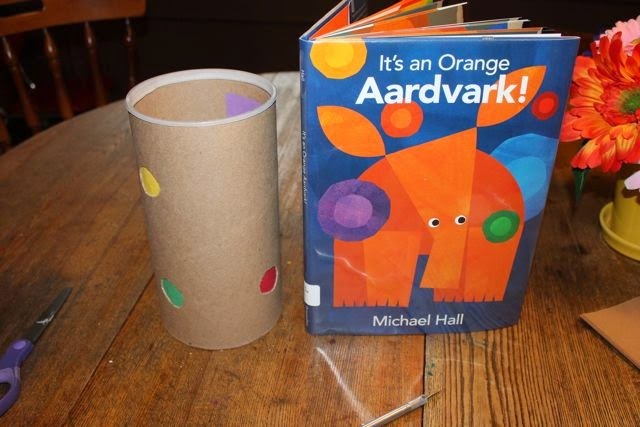 However, on our weekly visit to the library we found Michael Hall's his brand new book It's An Orange Aardvark which inspired an activity for my two-year-old daughter. 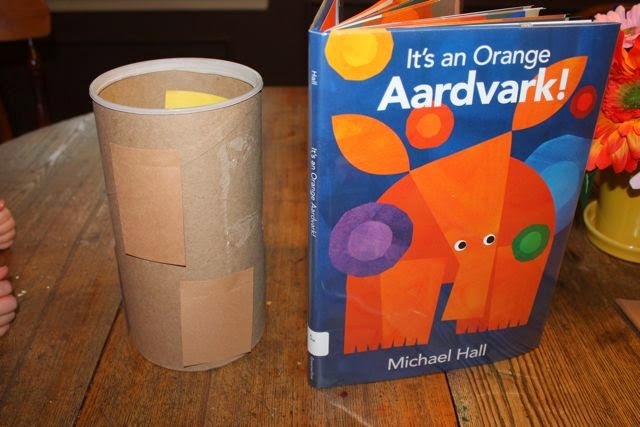 It's An Orange Aardvark is another great book by Michael Hall! In fact, I would say that it is my favorite read aloud of all his four books. 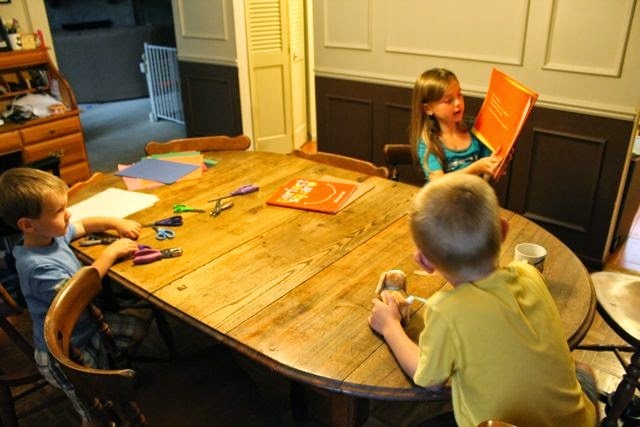 In the story, five carpenter ants hear a "BOOM! and "Rumble! Rumble!" while they are asleep in their tree stump. The carpenter ant in the red hat gets the rest of the ants in a tizzy when he speculates that the noise could be an aardvark that wants to eat them. The ants drill holes through their stump to see outside (which are illustrated with die-cut holes reminiscent of The Very Hungry Caterpillar). 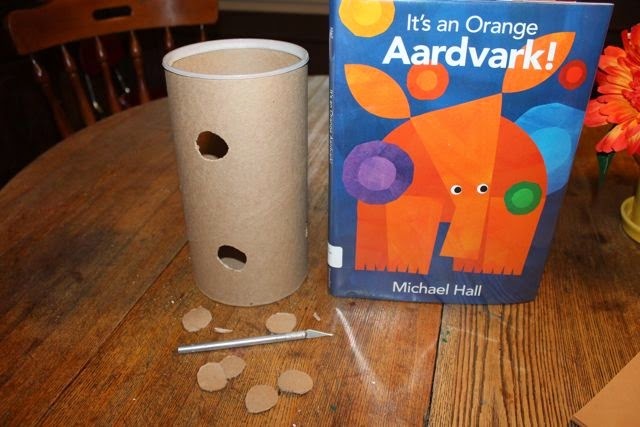 All they can see are colors through the holes and with each new color the red-hatted ant's theory intensifies about aardvark and their impending doom. The ant in the yellow hat is a little more rational, thinks about the colors he is seeing, and has a much more realistic theory about what is outside their stump. I removed the label from a large rolled-oats food container. I thought it would make the perfect tree stump. Then I drilled ("Wrrrrr!") six circles -- well, actually cut with an x-acto knife -- in random places all over the container. Then, I cut squares of construction paper for each the six colors revealed to ants as they drilled their stump -- orange, blue, red, green, yellow, and purple. 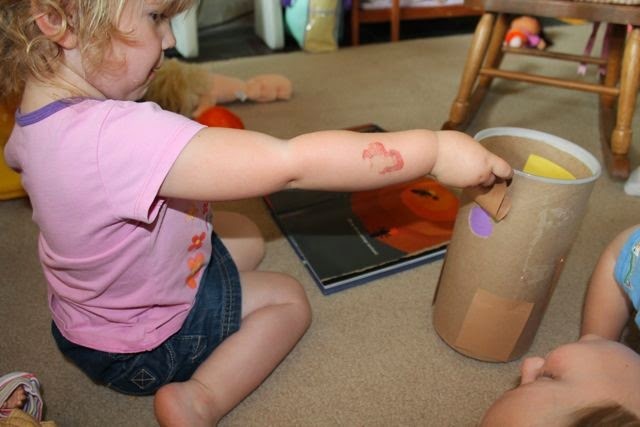 I glued the pieces of paper to the inside of the container so that the colors showed through the holes. 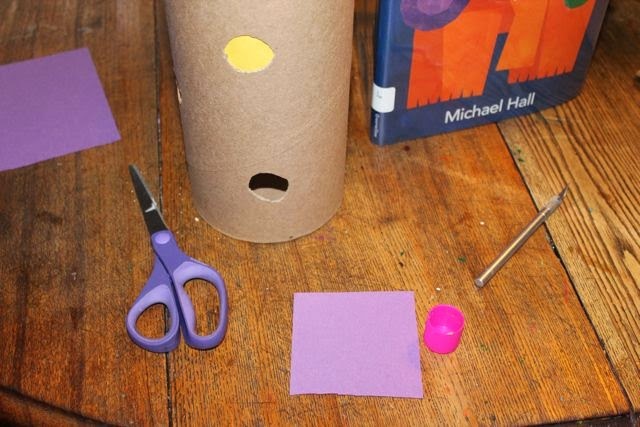 Next, I pasted "life-the-flaps" made out brown construction paper to cover each hole. 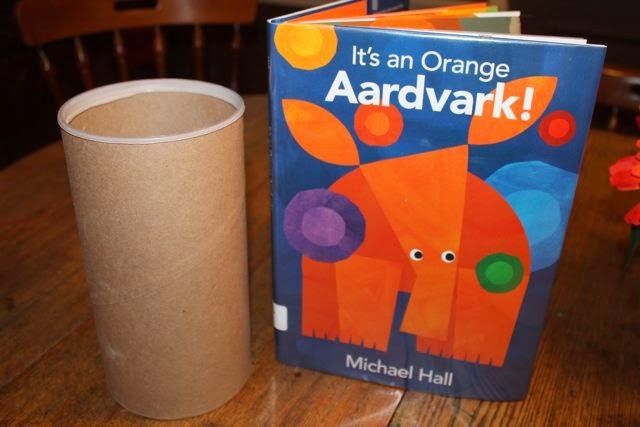 We read It's an Orange Aardvark together! After reading, my daughter placed carpenter ants into the stump. 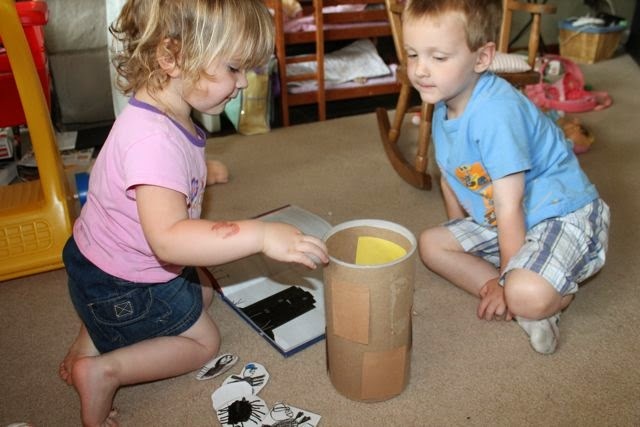 My older children drew the ants with black crayons on white construction paper and we laminated them. 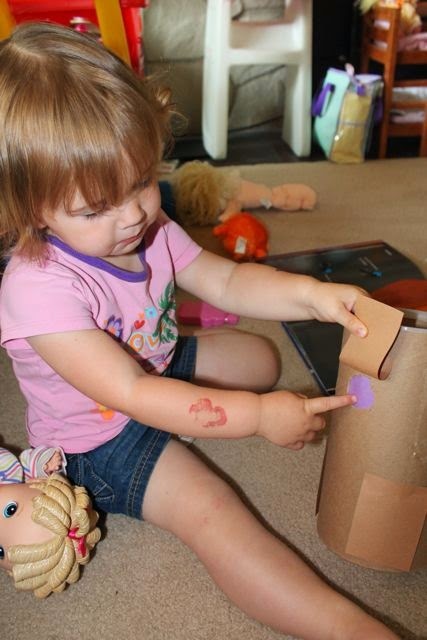 After counting all the ants she lifted the flaps and told us the colors she found. I think she liked the activity! 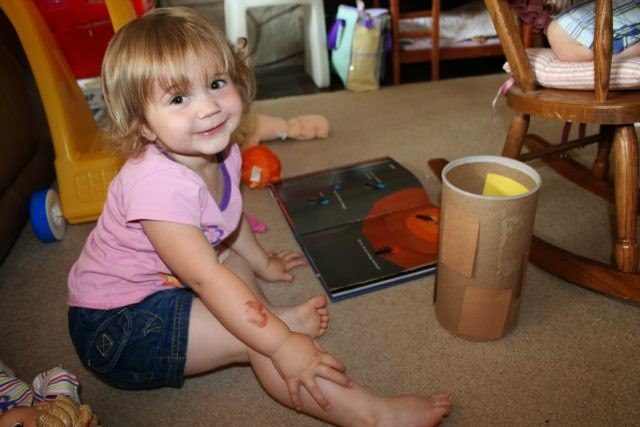 When her mom came home from work she told her all about her new favorite book! Our birthday celebration for Michael Hall shaped up just fine! I want to thank my daughter for sharing her Perfect Square activity with us. It ended up being the perfect way to spend the day together as a family!